Helpful Methods : How to remove blur from an image? In your journey of capturing and preserving best memories, you don’t have to be a photography expert. Photos are important part of everyday living for most people. You get important information and preserve memories in photos. That’s how essential good photos are to the owner. As an everyday photographer, you notice you get a bunch of blurred photos often. Without information on how to remove blur from those photos can make you panic. In fact, some first time photographers detest from taking photos because of getting blurred photos. But, should a blurred photo discourage you? No. In this article we will look at several ways you can remove blur from your photo. Photo blur removal process it straightforward, and with simple few clicks, you are done. You should not discard blurred images. 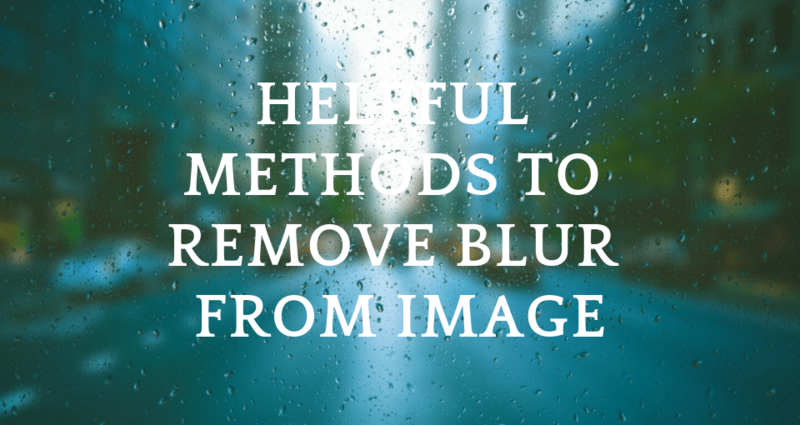 There are several ways you can remove blur from photos online. The tools can be accessed and used online, or you can download and install them on your device. Notably, there are images that are so much distorted that there is no way they can be fixed fully. For such images, you can either discard them or resolve the keep them the way they are. That implies, the only best way to have a sharp and clear image, is through a careful focus and avoiding movements during capturing a picture. That way, you get either good photos, or photos that require minimum editing to improve their quality. It’s an era of social media where many people share information in form of photographs. Unfortunately, you don’t come across nice photos on social media at all times. Sometimes a friend shares blurred photos with you which you mostly delete without a second thought. However, getting a blurred photo should not be the end of the road. There are many blur remover online tools you can choose from. Wrong focus. If you don’t position and focus your camera properly, you will probably get an unclear image of the object. This type of blurry is commonly known as focus blur. There are modern cameras that have an autofocus features. When using these cameras, you will get clear images. However, the autofocus features fails making you get blurred images. Shaking camera. Sometimes you shake camera will take a photo which makes you capture a distorted image. In the world of photography, this is known as motion blur. Blurred photos can easily be fixed through a process known as deblurring. This article is for if you are interested to learn various ways you can have distorted photos fixed. We will give you important information on how to remove blur from image. These are tools that can help you get the sharpest and clear photos as a pro with a little sweat. Knowing how to make a blurry picture clear online, is one of the basic skill you will require today. The soft wares you can get are free for use online. There are smartphone apps too which you can use to deblur photos. You can use any of these listed Ten tools to easily deblur image online. This software is user friendly as it allows you fix blur photos. There is so much you can do to improve your photo using this tool for free. There are many users of this tool meaning it never disappoints. Others have tested its usability. Therefore, you can use it with all confidence it’s one of the best you can come across in the market. This is a very nice tool that will not disappoint for blur remover. Being available for only Windows users is the only limitation of this tool. This tool is available as a free software for use on windows. It has an android app version. The software is easy to use, and you can fix your photos fast. The software allows you to edit the photos for a sharper appearance. Focus Magic tool come in handy when editing and fixing blurry motion photos. Many users like the tool as it’s easy to use. The toll is available for both Mac and Windows users. The tool is available for users with iOS for their devices. The app helps the photographer take clear photos. This app is available for iOS device users. Unlike Focus It tool we have looked into above; this app is not free. But considering what it does, it’s worth the price. This is a popular tool for photo sharpness enhancement. It’s available both for Windows users and as an app. This software is available for free and it’s automatic. From the name, it’s used to sharpen photos. It’s available for both Mac users and Windows users. The tool has got the highest number of positive reviews and top rated. It’s an easy-to-use software with clear and simple to follow guidelines. It’s available for both Windows users and Mac users. This tool is available for Android devices too. This app has the highest number of positive ratings and reviews. The app works by highlighting the focus area and blurring the other area. With the information about the above listed blur remover online tools, you don’t have to continue deleting or discarding blurry photos. Now you already know how to remove blur from a photo. From now, appreciate all the photos you get. For unclear photos follow the simple steps in using any of the above tools. You can access more useful resources on how to remove from a photo online. Read those materials, and if save them for future reference. Such important information will come in handy someday. There are experts who use blur intentionally, to create a masterpiece of art. However, where blur image is not intentional but accidental, the outcome is always discouraging. It is easy to differentiate between a beautiful blurry photo from an ugly blurry photo that was captured accidentally. That’s why you need the deblurring tools available to correct blurry images to bring out the indented sharpness and clarity. Learning how to enhance a blurry photo online is important. This knowledge will save you from having a collection of blurry images. You will apply the skills on how to fix blurry pictures online.